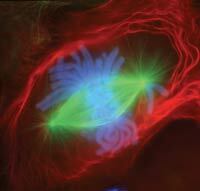 Dividing newt lung cell seen under a light microscope and colored using fluorescent dyes: chromosomes in blue, intermediate filaments in red, and spindle fibers (bundled microtubules assembled for cell division) in green. Intermediate filaments are only found in multicellular organisms. Compare with the other components of the cytoskeleton, there are at least 50 different kinds of intermediate filaments, usually particular to a few cell types. They generally fall into six molecular classes, based on amino acid sequence. They share the same general structure, being made up by fibrous proteins of the keratin family, similar to the protein that makes up hair and fingernails. In cells, these proteins are organized into tough, rope-like gathers 8 to 12 nm in diameter. The intermediate filaments are grouped into six types based on similarities in amino acid sequence and protein structure. Type III: vimentin, desmin, GFAP and peripherin in muscle cells and fibroblasts. Type IV: neurofilaments, α-internexina in neurons, especially in axons, synemin and syncoilin. Type V: lamins, fibrous proteins having structural function in the cell nucleus, that lie below the nuclear envelope. Type VI: nestin, present in stem cells. This page was last modified on 13 April 2014, at 22:34.